Mini Mixer. Powerful Performance. 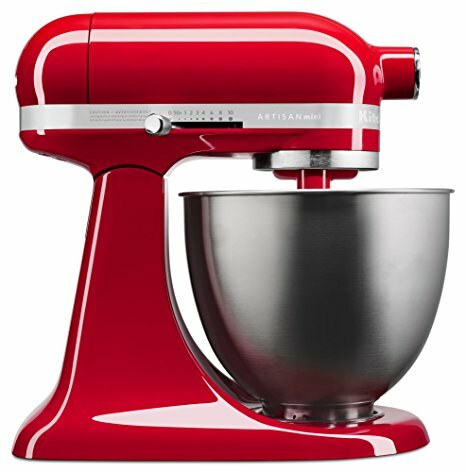 The Artisan® Mini tilt-head stand mixer makes up to 5 dozen cookies in a single batch, with the same power as the full size KitchenAid® tilt-head Stand Mixers while being 20% smaller, 25% lighter*. Smaller footprint, but plenty of power, can be used with all KitchenAid® attachments. Comes in great colors to match any kitchen. Power Hub-Turns your stand mixer into a culinary center. With more than 10 optional hub powered attachments, use the power of your stand mixer to help you make pasta from scratch, spiralize zucchini and much more. 10 Optimized- Speeds Powerful enough for nearly any task or recipe, whether you’re stirring wet and dry ingredients together, kneading bread dough or whipping cream. Tilt-Head- Design Allows clear access to the bowl and attached beater or accessory so you can easily add ingredients for a recipe. Locking the head into place during operation keeps the beater-to-bowl contact close and efficient.